Bucket List From Fellow Members— Go Out And Explore Michigan! The White Pine Trail runs 92-miles from its southern point in Comstock Park to Cadillac. The “vibe” in each section of the trail is unique. You can ride bikes and visit quaint shops in Rockford, see Amish buggies, wildflower fields and enjoy amazing views of the Muskegon River in Big Rapids. Hikers can also experience the quietness of the trail while spotting wildlife and enjoying the nearby lakes in Cadillac. The trail offers many experiences for hikers young and old. Various hikes are available depending on the trail and how long you wish to walk. The views are gorgeous with waterfalls into Lake Superior and lots of look-outs. The largest hiking trail in the USA! It stretches over 4,600 miles! It is a year-round trail system with many connector trails to get you to the most beautiful destinations! My hiking group SHE_Mitten_Hikers (Self Healthy Exploring) has snowshoed and hiked our favorite stretch in northern Newaygo County around Nicolas Lake. You can hike to the highest point in the county at 1,270 feet. The Manistee River Loop is excellent. The suspension bridge is beautiful, and I’ve had a bear sighting on this trail. The Jordan River Pathway is such a gem. There is a fish hatchery just off the trail, beautiful scenery and some of the highest elevations in our lower Michigan. Michigan Trails and Greenways Alliance is working with communities all over Michigan to build a series of five “Great Lake to Lake Trails” that will link existing trails into a series of destination trails that will allow people to move from one Great Lake to another. 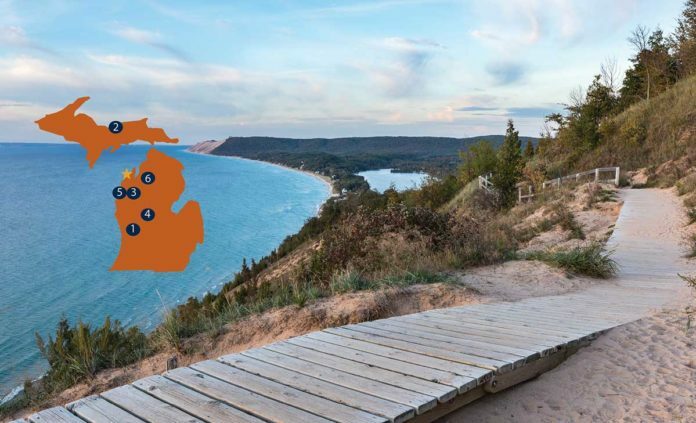 These trails, three in the lower peninsula and two in the Upper Peninsula, will link Lake Michigan with Lake Huron and Lake Michigan with Lake Superior and bring communities together in a pathway to provide a recreation experience and transportation opportunities and the chance to learn about our state’s natural resources and historical legacies. Help us create a “Best Ice Cream Shops” list to visit this summer. We will publish this list on the best “scoops” in our June issue. Submit your favorites by April 20.